Anti-Aging : Could Your Job Help Preserve Your Aging Brain? THURSDAY, Nov. 20, 2014 (HealthDay News) -- Jobs requiring intellectually challenging tasks may help preserve thinking skills and memory as workers age, a new study suggests. Researchers from the University of Edinburgh scored workers' jobs for their complexity with people, data and other things. Complex data jobs might involve coordinating or synthesizing data, for example. Less complex occupations might involve comparing or copying data. In working with others, more complex occupations involve instructing, negotiating or mentoring. Less complex roles might involve taking instructions or helping. "We see that those in more complex jobs generally do better on a range of cognitive ability measures," said study author Alan Gow, an assistant professor of psychology at Heriot-Watt University and the Centre for Cognitive Aging and Cognitive Epidemiology in Edinburgh, Scotland. "That's not necessarily surprising ... but we were able to add an interesting twist [because] we had data on our participants' cognitive ability in childhood," Gow added. Dr. David Knopman, vice chair of the Medical and Scientific Advisory Council at the Alzheimer's Association, praised the "very nice and unique" new research, but pointed out that it was an observational study that could not prove that job complexity leads to better thinking skills as people age. "But it says that the things we do during our lifetimes can make a difference for risk reduction for dementia, and that's a good thing," added Knopman, also a professor of neurology at the Mayo Clinic College of Medicine in Minnesota. "This is obviously not a quick fix. If someone is not using their brain in a stimulating, challenging way and suddenly decides to do so, that's not what this is saying [will work]." 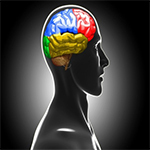 The study was published online Nov. 19 in the journal Neurology. Alzheimer's disease is the most common form of dementia, a deterioration of thinking skills, reasoning, judgment and ability to perform everyday activities. More than 5 million Americans have Alzheimer's disease, according to the Alzheimer's Association. Gow's study joins a growing body of research bolstering the notion of "cognitive reserve." That's the theory that a more stimulating mental environment helps protect thinking skills as people age despite possible brain deterioration. Gow and his team analyzed various levels of job complexity using the Dictionary of Occupational Titles. Jobs scoring highly for the complexity of work with people, for example, are lawyer, social worker, surgeon and probation officer. Jobs scoring lower for complexity of work with people are factory worker, bookbinder, painter and carpet layer, according to the researchers. For complexity of work with data, high-scoring jobs include architect, civil engineer, graphic designer and musician; lower-scoring jobs are construction worker, telephone operator or food server, the researchers reported. Gow and Knopman both noted that people with higher IQ scores tend to gravitate toward more complex occupations. That makes it more difficult to discern whether high innate intelligence or job stimulation is a stronger factor in better brain aging. Gow said study participants have been asked to return for further memory and reasoning tests between the ages of 70 and 76. He and his team can use those results to examine how occupational complexity affects these brain skills even farther out, as well as other lifestyle and environmental factors. "It's all part of the broader research agenda which aims to better understand how cognitive abilities [thinking skills] change with age, and identify the factors that predict this," said Gow.